I often underestimate the distances you have to travel to get in position for a storm or, more commonly, to get to “that other storm on radar”. It is easy to look at a radar map or US map and see that storms will develop two states away and think: “Hey, we should driver over THERE!”. Even though I have been chasing for almost 10 years I still find it difficult to grasp – mainly because I don’t actually drive myself and, as such, don’t get that gut feeling of how far away a target area or storm on radar actually is. 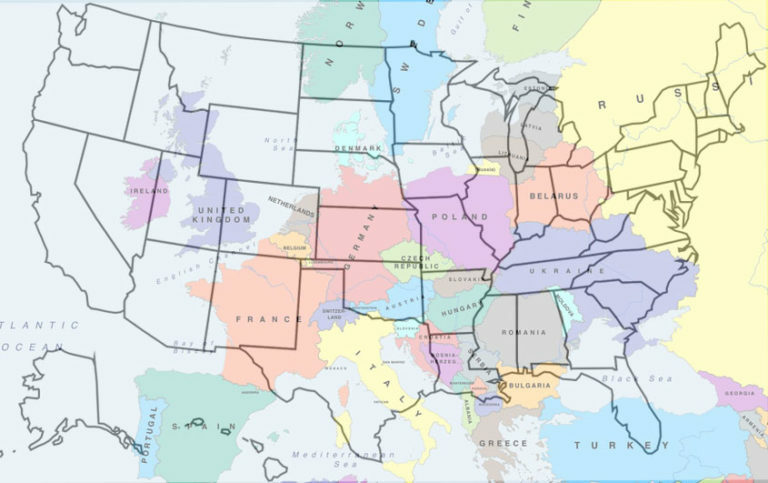 For that reason I created this map overlay with the map of USA on top of a map of Europe. I know most of you who visit this blog are Americans but for my fellow Europeans this could be very interesting to use as a reference. The map overlay is an estimate. I used the really cool website TheTrueSize.com as a reference, where you can drag and drop states and countries over one another. The chase season of 2012 was probably my worst in terms of driving. We drove from Oklahoma to New Mexico to North Dakota into Minnesota and back – all in just 5 days! I still admire Gene Robertson (who was behind the wheel) for the dedication they put in for us to see storms that season. It paid off as well, after getting up at 5 almost every morning, driving for a full day only to see rain storms we finally got to see two tornadoes on the last hour of our last day. The lesson I learned that season is that you have to cover the distances needed in order to see the storms you want to see!